The Player Strategy screen is completely optional. Even if you do not touch these settings, the AI will do its best to manage your team effectively when you auto-play games. These settings, however, allow you to micromanage where it suits your tastes. Additionally, if you play out your games, there is no need to configure your strategy settings, since you will determine your strategy on the fly! If you enjoyed setting overall team strategies, then the Player Strategy screen will be right up your alley. If you have a lightning-fast runner and want to give him the green light every time he reaches base, you can set that preference here. Worried that your aged starter won't last the whole season? Put him on a limited pitch count here. The Player Strategy screen is another two-paned screen. The top pane is a player list, on which you can take advantage of OOTP's Views, Filters, and many of the Common Drop-Downs. Review those sections to get a better understanding of how to manipulate the data on this screen to suit your needs. Adjust to Team Strategy Settings - the player will ignore his personal strategic preferences and use the team strategic preferences instead. Override Team Strategy Settings - the player will ignore the team strategic preferences in favor of his personal strategic preferences. Hit and Run Defines how frequently the player will use the hit and run play, in which one or more baserunners are put in motion before the ball is hit. The batter tries to make contact whether the pitch is a ball or strike. Hit and run plays can result in a runner going from first to third on a single, or even scoring from first on a double. This play is usually put on with a good contact hitter at the plate. Sacrifice Bunt Defines how frequently the player will try to advance baserunners using the sacrifice bunt. Bunt for Hit Defines how frequently the player will try to bunt for a hit. Force Start/Use at Position Forces the AI to use a certain player at a specific position, regardless of what the AI thinks is the best fit for the player. 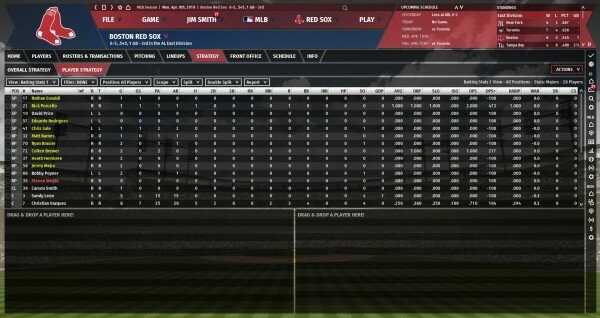 Force Lineup Spot Forces the AI to use a certain player in a specific place in the batting order vs. either LHP or RHP. Never lift for a pinch hitter Check this box when you never want to pinch hit for the selected player. This setting is typically used for elite hitters. Never use as a pinch hitter when tired Check this box to prevent the computer from putting in a tired player to pinch hit. This setting is used in cases where you put someone on the bench to rest him, and you don't want him to become fatigued by playing in the game. Force Role Force this player to be locked into the specified role (starter, reliever, or closer); AI setup options will always leave the player in that role. Use as Opener Use the pitcher in the "Opener" role, where he starts the game but is limited to a few (usually 1-2) innings, at which time he is replaced by a "Follower." Use as Follower Use the pitcher in the "Follower" role, where he is designated to come into the game in relief of a player using the "Opener" role. Set starters in the rotation normally, and in their game strategies, set them to be Followers. In your bullpen, set some relievers (usually around 2) to have a secondary role of Opener. When a starter's spot in the rotation comes up and he's marked as a Follower, one of the Openers will start instead if they're rested. If no Openers are available, the starter will start himself (unless opener usage for the team is set to "always" in Team Strategy, in which case a random reliever will be used.) Using this method, the Openers may still pitch other games in the bullpen according to their primary role, so that situation is more likely to happen. Put relievers in the rotation with their strategy set to Opener, and then put the starters in the bullpen with their secondary role set to Follower. In this case, the Openers will never pitch in relief, but the Followers may, leading to them not being rested enough to work as a Follower in a particular game. Note that in both cases a player placed in the rotation must use the Player Strategy option to set his status as an Opener or Follower, and a player in the bullpen must use the Seconday Role to set his status as an Opener or Follower. The league-wide AI use of Openers can be set in the General Strategic Tendencies section of the Stats and AI tab of the League Settings screen. A pitch count limit is simply a number. Once a pitcher reaches his pitch count limit, he will be replaced in the game. Pitchers will not be removed in the middle of an at-bat due to pitch count limits. Actually, the computer will often elect to remove a pitcher before an at-bat that would likely put him over his pitch count limit. For example, if you have a pitcher on a 100-pitch limit, and a new batter is coming up with that pitcher at 97 pitches, the computer might elect to relieve him at that time. Bench Player for X Days Setting this number above 0 causes the player to be benched. This means he will not participate in any games regardless of whether he is listed in the lineups or depth charts. This is often used if you want to force a pitcher to rest heading into the playoffs, etc. There is no morale penalty for benching a player. Bench Player if DtD Injury To control how and when to play a player if he has an injury that he can play through (Day-to-Day injury). Letting the manager decide will use the same logic as an AI team can use, otherwise, you can specify what overall severity to sit players for. This severity is separate from the individual effects, so, for example, a pitching injury severity will be mostly based on the "influences throwing" impact, but can be modified by the others too. Available as PH if DtD Injury If the previous setting is set to anything other than "let manager decide", this checkbox will instruct the AI whether to consider the player as a pinch hitter if he's injured. He may occasionally still play even with the box un-checked, but the AI managers will attempt to avoid playing an injured player if they can depending on the settings. With the box checked, then he will be available to bat or play if the above setting allows him to play. Use as a two-way player To control if a player is to be used as a two-way player. If checked, then he will show up on both lineup and pitching rotation lists, and will be considered available to use either batting or pitching. If not, then he will only be used as his overall position is set to. For minor league players, if AI control of promotion/demotion/strategy is set to minor league managers, then the AI manager may override this setting based on their perception of the player. To avoid this, use the "lock player to team" box above, which will prevent that AI control.